Jamie Whincup was left stunned by a costly driver error which has left his title Supercars title hopes hanging by a thread at the Coates Hire Newcastle 500. 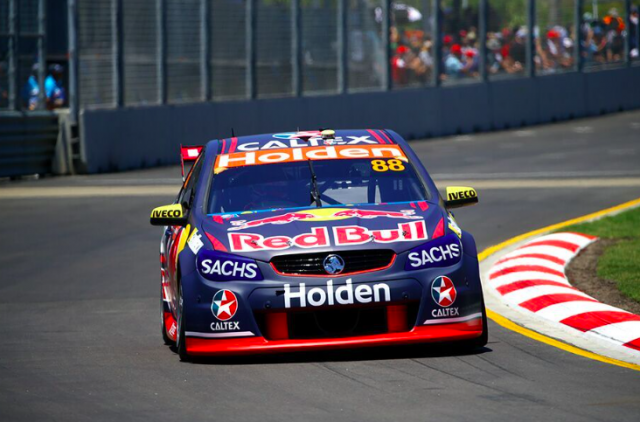 The Red Bull Holden Racing Team driver witnessed a 30 point lead turn into 78 point deficit after an opening lap mistake put him out of contention in Race 25. Whincup made contact with Nissan Motorsport’s Michael Caruso at Turn 3 while fighting over fourth place, which resulted in steering and suspension damage after hitting the wall. The six-time champion limped back to the pits where his team completed a repair on his Commodore, before returning 13 laps down. Whincup managed to bring the car home in 21st spot while rival Scott McLaughlin took a step closer to claiming a maiden title after taking his eighth race win of the season. “I have to put my hand up, it was my fault,” Whincup told Speedcafe.com. “I was in the wrong place but I was trying to fend off Ricko (Rick Kelly) and if I had bottled up he would have gone around the outside. “It was such a small bit of contact and it was day over with massive consequences in the grand scheme of things. “I just could not believe what I was witnessing. How do I deserve this? “I knew then that was a defining moment, but it is what it is. “I have made a lot of sacrifices this year to give ourselves an opportunity. Whincup admits he will need a miracle to secure an unprecedented seventh crown on Sunday. McLaughlin only needs to finish 11th or better to scoop the title. “Absolutely, (we need a miracle) and we don’t wish anything untoward on anyone,” he added. “The chances of that happening are very slim. If anything we will race hard tomorrow and make sure we finish the year with plenty of pride. “It is a tough gig but that is what it is. “We know that when we sign up for this crazy sport and to be a driver you are exposed, and a little error has massive consequences on a lot of people. Supercars return for a 20 minute qualifying session followed by a Top 10 Shootout to set the grid for the final 95 lap race of the season.